For 50 years, scientists have known how to create amino acids in the laboratory, the basis for understanding how life first formed on early Earth. They have not, however, been able to determine how amino acids couple into strings of peptides. These proteins are the basic components of nucleotides, which make up DNA and are essential for the structure, function and regulation of a body's cells, tissues and organs. Now geochemists say that a simple volcanic gas  carbonyl sulfide  may be a key ingredient in this process. Reporting in the Oct. 8 Science, Luke Leman and M. Reza Ghadiri of the Scripps Research Institute, along with Leslie Orgel of the Salk Institute for Biological Studies, describe their experiment to combine carbonyl sulfide with free amino acids in a reaction that created di-, tri- and tetra-peptides (two to four amino acids coupled together like single beads brought together on a string). Unlike chemicals used in past experiments, carbonyl sulfide has been around for quite some time. "The novel feature is that carbonyl sulfide comes out of volcanoes nowadays and presumably has always done so," Orgel says. Past experiments to induce the condensing reaction of amino acids into peptides have used several different reagents that were not necessarily present in Earth's atmosphere at or prior to the origin of life. Fumeroles and sulfur deposits vent steam and gas along Kilauea volcano's rim in Hawaii. Volcanoes around the world emit carbonyl sulfide, a simple gas that may have played a role in the start of life on primitive Earth. Image by Chris Keane, courtesy of the Earth Science World Image Bank. "The only other one that has been identified is pyrophosphate," says James P. Ferris of Rensselaer Polytechnic Institute. 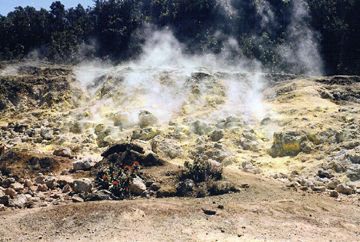 Carbonyl sulfide, however, has "the advantage of being formed in volcanoes and is a gas that is emitted from them," Ferris says. Thus, it is reasonable to assume that the gas would have been present some 3.5 billion years ago. Due to the nature of the gas, however, it would not have been found in high concentrations in Earth's early atmosphere, the authors write. Therefore, if carbonyl sulfide played a key role in the formation of peptides, it most likely occurred in localized regions, close to volcanic sources. "Carbonyl sulfide is destroyed in water, so it would have to be produced continually to have been important," Ferris says. "This is a possibility as an emission from volcanoes." Conducted under a variety of different conditions meant to simulate Earth's early atmosphere, the experiment included aqueous conditions and ambient temperatures. The researchers also introduced metal ions, oxidizing agents and alkylating agents that enhanced peptide yields and the rate at which amino acids condense into peptides. Using carbonyl sulfide produced yields of 80 percent, indicating that the majority of the amino acids became locked into peptide bonds. "Carbonyl sulfide may provide a method for the formation of peptides, some of which may have catalyzed reactions on the primitive Earth," Ferris says. However, "the model still requires the formation of genetic material that contains the genetic code that directs the synthesis of those proteins," he says. Indeed, Orgel says that the experiment will now allow researchers to explore the "missing link" between simple proteins and complex DNA structure composed of nucleotides. The next step, he says, is to see if carbonyl sulfide may act as a catalyst to combine proteins into the nucleotides that compose all DNA.